Expats, we will help you to set up Utilities! We help expats who or moving to a new house to set-up the utilities free of charge. We saving you time and money by finding the best deals for energy, internet, tv, water, mobile and even insurances. We offer a friendly customer service to make you life easier. Yes, I give permission as described in the privacy statement. What makes us brilliant ? 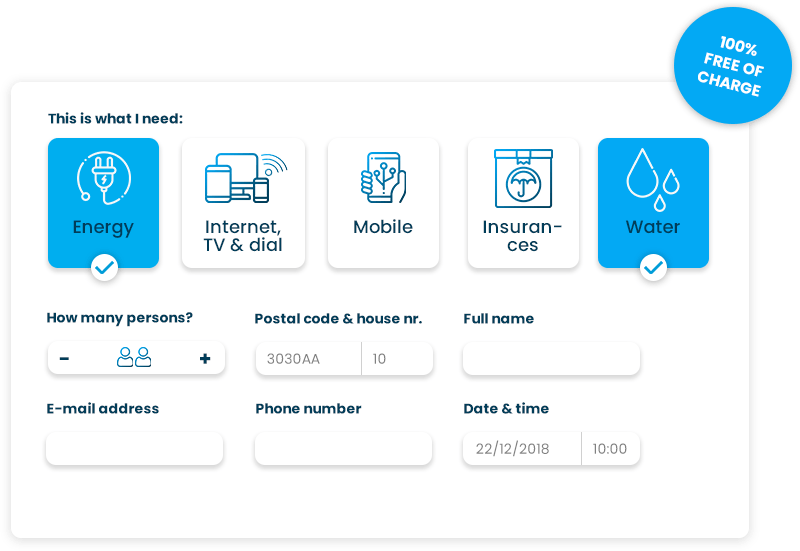 We register you for free to the local water company and provide you with a market comparisons for energy, internet, tv, mobile and water. Everything is set up ready when moving days arrives. It’s possible to do it completely online or we can call you to arrange everything by phone. Easy Nuts works with trusted suppliers that suits expat needs best. Why Easy Nuts services ? The dutch market for energy, internet and mobile is open to private companies to stimulate competition. Easy Nuts only works with utility providers who are trusted and have good tariffs. It’s very difficult for expats to arrange electricity, internet an tv in the Netherlands, because all websites are in dutch. We offer flexible contracts for all utilities so you can cancel them without a penalty. Let’s make the world a better place for everyone. We deliver 100 % green energy and can arrange sustainable solutions for your new home like solar panels or isolation so you can save on energy bills. Onze support staat altijd voor u klaar met persoonlijk advies. Our English customer support is ready to answer all your questions. After you submit your details, we will call you back within 24 hours during weekdays between 09.00 – 21.00. You will receive an email with your selected utilities, contract information and personal details. Easy Nuts will connect you! Our English customer support will get you connected to your selected service providers. Read more reviews at KiyOh.nl! We work with trusted and sustainable companies in the Netherlands for energy, internet, tv, water, mobile and insurances.